The US has accused Iran of seeking a "near-total information blockade" to silence anti-government protesters. The allegations came after opposition supporters clashed with security forces as Iran marked the anniversary of the 1979 revolution. The US government said it had information that the telephone network was taken down, SMS messages blocked, and internet communication "throttled". China and Burma have also been accused of blocking internet communication. Analysts say some governments make strenuous efforts to block modern communications among opponents, with varying degrees of success. The Iranian opposition had called its supporters on to the streets to mark the anniversary of the Iranian Revolution, with clashes reported in Tehran as well as other cities. But reports suggest opposition rallies were dwarfed by the huge turnout to hear President Mahmoud Ahmedinajad address the official celebrations. State department spokesman PJ Crowley told reporters: "Iran has attempted a near total information blockade. "And it is an unprecedented and overwhelming step, using force to intimidate their own people and to restrict the freedom of assembly and the freedom of expression. "It is clear that the Iranian government fears its own people." He said his statement was based on US monitoring of communications within Iran. Google said on Wednesday that Iranian users were having trouble accessing its Gmail service. Reuters news agency quoted a Microsoft source as saying the company had not experienced any disruptions to its Hotmail service in Iran. 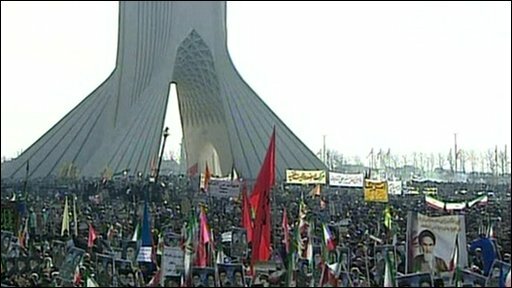 Hundreds of thousands of pro-government Iranians rallied to mark the 31st anniversary of the country's revolution. President Ahmadinejad used the rally to attack the West, and said Iran had produced its first stock of 20% enriched uranium. The day was considered a crucial trial of strength by both government and opposition. This time it was the government that had the upper hand. They drafted every available supporter, and probably persuaded many uncommitted Iranians, to join their rally in central Tehran. In the streets close to the rally, a long line of parked buses was evidence of the effort to bolster numbers. At the same time, the opposition spoke of possibly the largest deployment of security forces since the election last summer. Any gathering of opposition supporters was rapidly pounced on. But even that effort may not be enough to end the stalemate evident for months now between government and opposition. And anything the government tries to do to consolidate its position, such as arrests of opposition leaders, or the execution protesters, could rebound on them, and hand back the initiative to the opposition. Mr Ahmadinejad told the crowds Iran was now a "nuclear state" and would soon treble output of 20% enriched uranium. The opposition tried to stage counter-demonstrations, but faced a big security crackdown, and several of its leaders were attacked. Official events were held across Iran, but the main gathering was at Tehran's Azadi Square. State TV showed tens of thousands of people filling the streets. Amateur footage purportedly showing opposition protests has been appearing on the video-sharing website YouTube, including at least one rally in the Tehran underground. Opposition leader Mehdi Karroubi had been intending to attend the Saddeqiya street rally, but he was beaten up by members of the Basij as he emerged from his car. His son was arrested as he tried to intervene. The reformist former President Mohammad Khatami was also reportedly attacked. His brother, Mohammed Reza Khatami, and his wife, Zahra Eshraghi, the granddaughter of the late Supreme Leader Ayatollah Ruhollah Khomeini, were arrested but later released. Other opposition sources said security forces had fired shots and tear gas at supporters of Mir Hossein Moussavi, Mr Ahmadinejad's main rival in last June's elections. Later unconfirmed reports said Mr Moussavi was prevented from joining a rally, and his wife Zahra Rahnavard - also a key opposition figure - was "beaten". Opposition protests have also been reported in the cities of Tabriz, Shiraz and Isfahan. Anti-government websites urged marchers to display green emblems or clothes - the colour adopted by the opposition movement after the disputed election on 12 June last year. Deadly clashes erupted after the poll, and have taken place sporadically since then. Correspondents say the situation is now a stalemate, with the opposition showing it is still around and cannot be kept off the streets. The government is not used to such protests and is infuriated by this, they add, although opposition support appears not to be enough to overthrow the government. What will calm the unrest in Iran?